The delicate flavors of salumi have captivated the senses for centuries, and have earned them a popular place as exquisite antipasti and the key ingredient in entire meals. These savory meats, including favorites such as salame, prosciutto, and coppa, reflect generations of Italian craftsmanship ready for your dining-room table and party trays. 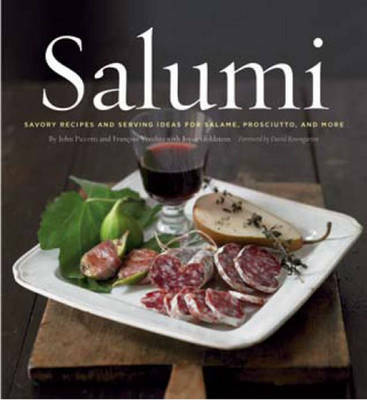 "Salumi" captures more than 50 delicious recipes incorporating these artisanal cured meats, accentuating the range of Italian offerings. For lunch, try a mouthwatering panini with goat cheese, arugula, roasted peppers, and salame, or pizza with pancetta, sun-dried tomatoes, red onions, and basil. Surprise your guests with a first course of polenta with salumi and raisins, and follow with a main dish of scallops wrapped with pancetta and a salad of oranges, onions, and coppa.